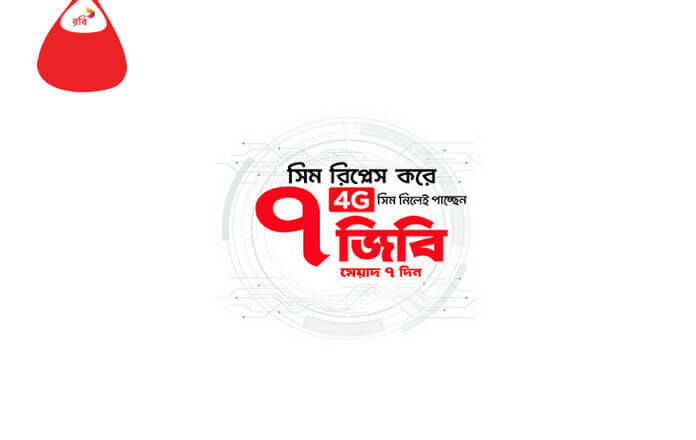 Robi 4G SIM Replacement Offer 7GB Bonus! Robi 2nd popular mobile operator organization in Bangladesh, Robi already launched 4G network service. Mobile operator Robi provides 7GB internet data bonus with 4G SIM Replacement. As an associate innovative digital brand, Robi is delivery a brand new update to customer’s life. prepare for expertise wonderful things along with your 4G enabled SIM. If replace Robi 4G SIM after that customer will get 7GB free internet bonus within 48 hours. So, check offer details from below, we have added the full details about this offer. Robi 4g sim upgrade offer 2019, replace Robi sim offer 2019. To upgrade Robi old SIM to 4G SIM after that accept this offer. Robi 4G SIM replacement price is BDT 100. After Replace the SIM customer will get 7GB internet bouns. 2GB regular 5GB 4G network. Bonus internet validity for 7 days. The bonus internet will be added within 48 after replacing. If you already Replaced your SIM you will not get the offer. Customers need documents National ID/ copy, Photo, Old SIM, Fingerprint. Note: To Replace Robi 4G SIM please go to Robi nearest customer point. Excellent! you are browsing the full content, please SHARE this post to help us, visit our website for the next special offers.